On occasion we will visit a place that’s not on our original list of 50. We may hear of a new burger joint worthy of exploring. Such was the case of Dot’s Hophouse and Cocktail Courtyard in Deep Ellum. 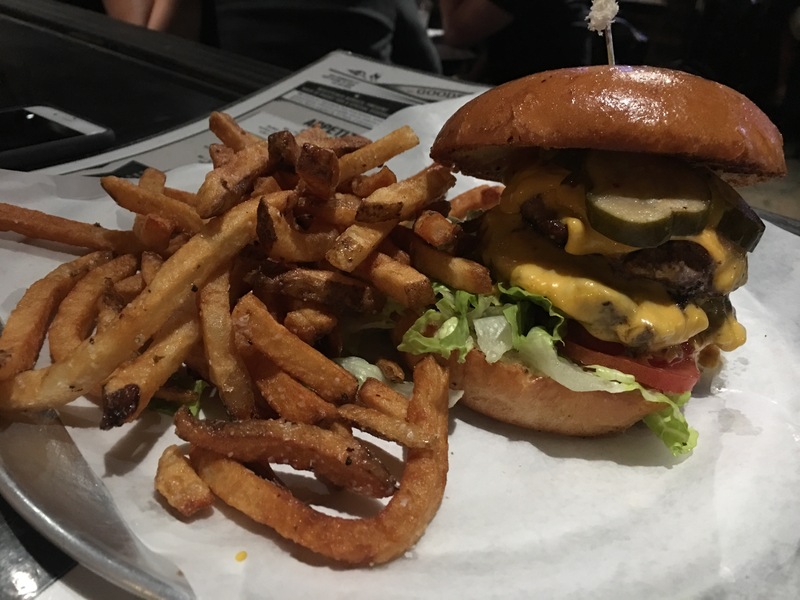 Dot’s bought the original Club Schmitz grill when it closed it’s doors after 68 years serving thousands upon thousands of double cheeseburgers to every true burger loving, cheap beer drinking Dallasite. That grill was seasoned with a lot of history and good times. If it was back in action we had to give it a try. Dot’s has a Club Schmitz Burger on it’s menu. It doesn’t come with the same ambience of the original but it’s a damn good burger. None of that fancy shmancy waygu on a brioche bun stuff. This is your classic good old American cheeseburger. It comes with excellent fries but we recommend trying the sweet potato tots as well. The beer is a tad pricier now but Dot’s has about 95 more varieties than Club Schmitz used to serve. Love the building and patio. Think a Deep Ellum version of Katy Trail Ice House. Their patio is at least twice as big as the inside and has it’s own bar, lots of picnic tables, a few trees and an enormous chandelier. Check it out. If you’re cool enough to enjoy Deep Ellum you’re going to love this place.